You've probably heard that adding lemon to your water can help you lose weight, in addition to a host of other healthy benefits. If you don't like lemons or you'd rather try another citrus fruit, oranges are another great option for getting tons of vitamins and a host of other healthy benefits. It probably comes as no surprise that this citrus fruit is a top choice for getting your vitamin C in. With 93 percent of your daily requirement in a single orange, this power fruit is top source of the germ-fighting vitamin, according to World's Healthiest Foods. According to an Australian study, a diet high in citrus fruits, like oranges, protects against cancer. In fact, the study showed that these fruits can reduce risks by up to 50 percent for some types of cancer, according to World's Healthiest Foods. The same study that showed that oranges and other citrus fruits reduce the risk of cancer also concluded that the consumption of fruits and vegetables reduce your risk of stroke by as much as 4 percent. Grab citrus fruit more times per day, and your risk drops by 19 percent! Orange juice can help prevent kidney disease and reduce the risk of kidney stones, so get to sippin', Care2, recommends. Two Japanese studies indicate that the consumption of mandarin oranges could help fight liver cancer. Researchers suggest that the carotenoid properties found in the fruit could be the reason, Care2 reports. Having problems in the bathroom? The high fiber content in oranges can help things move along a little better. The fiber helps stimulate digestive juices, according to Care2. Oranges contain concentrated levels of beta-carotene, which help protect your skin cells from damage and can even slow the aging process, Care2 says. Skip the caffeine and grab an orange instead. Oranges, like most fruits, are considered a carbohydrate. They also contain simple sugars that your body can quickly digest and turn into energy. The glycemic index sits at a healthy 40 (anything over 55 is considered high), according to Care2. This means you get an energy boost without the crash. World Healthiest Foods reports that the beta-cryptoxanthin in oranges (and foods like red bell peppers, pumpkins and papaya) can help reduce the risk of developing lung cancer. One study showed that consuming these foods could reduce the risk for this type of cancer by 27 percent. 1. 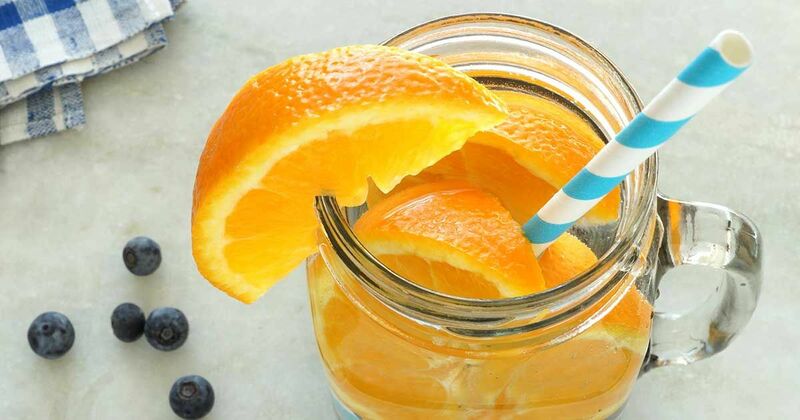 Place three pieces of orange and two slices or lemon into a jar or large pitcher of water. Squeeze the juice from remaining slices into the water and allow it to chill for two hours before drinking, as recommended by Infused Waters. 2. Fill a 2-liter pitcher with water. Add 1 sliced orange and 1/2 teaspoon vanilla extract. Mix well. Allow it to sit in the fridge for at least an hour, according to Detoxinista. What's your favorite orange recipe? Share your suggestions in the comments below.